When I was growing up I LOVED reading Nancy Drew. 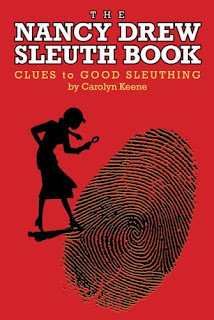 Last year at 5 Minutes for Books I hosted the Children's Classics Mystery Reading Challenge and it was tons of fun re-reading some of the old classics like Nancy Drew, Trixie Belden and Cherry Ames. One of the books I re-read was The Nancy Drew Sleuth Book . You can read my nostalgic thoughts HERE if you like. I recently found a brand-new copy of this sleuth book at Borders and just simply HAD to pick it up to share with one of you. If you have girls who like mysteries and are highly imaginative, you might want to consider this book. Especially since I'm offering it to you for free and for fun. Would you care to win? Simply leave a comment below. This contest is open to U.S. and Canadian residents only and will be open through Thursday, April 7th. * Blog about today's April Fool's Giveaways and add a second comment for one extra entry into any and all of the April Fool's Giveaways. Yes, I care to win one!! My girl would love Nancy Drew, I think. Haven't introduced her to that author yet. AWE! Can I say that I want this for me? ok, I really need this one! 'Course, these days, I do most of my snooping via the internet--using things like Facebook. And I'm TOTALLY snooping on YOU! My daughter is devouring Nancy Drew books right now. This would be a lot of fun. Loved Nancy Drew! I still compare myself to her sometimes - now I'm discovering other children's mysteries to read, like Judy Bolton. My daughter loves the boxcar children, but I haven't yet introduced her to Nancy Drew because I'm hoping to find some of the earlier editions. This looks like fun for when we get there! This sounds like a fun book. I loved Nancy Drew as a kid. Rereading would be fun. Thank you for all those giveaways! would love to win! My girl loves Nancy Drew right now. Thanks for the chance. Loved Nancy Drew as a girl-saved up my money to buy the books. Please enter me! I still love Nancy Drew. I loved Nancy Drew growing up. My mystery loving daughter needs this! My younger granddaughter would love Tell Me The Day Backwards and I have an older one who loves Nancy Drew! Thanks for your great variety of giveaways. This book sounds like fun!! I was a huge Nancy Drew fan growing up, though a little disappointed when reading as an adult. But they aren't really intended for adults. I picked up a couple of the older N.D. books at the used book sale last week. I don't like the re-done ones from the 80s. Too much "girl power" for my taste.